SkyRidge is a master-planned Mountain Community of 485 luxury homesites artfully placed on 670 acres with over 50% preserved as open space. The community is located in the Greater Park City Area on the northwest shore of the Jordanelle and close to the new Mayflower Mountain Village at Deer Valley Resort. SkyRidge features panoramic views of the water and beautiful mountain vistas and provides easy access to skiing at Deer Valley Resort and watersports at Jordanelle State Park. 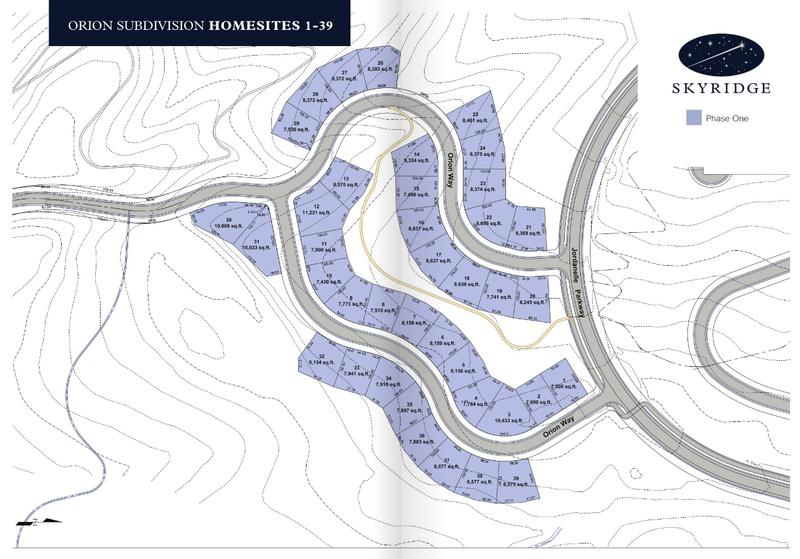 The first two SkyRidge Subdivision Final Plats were approved by the Jordanelle Specially Planned Area Planning Commission, with a total of 82 single family homesites in the Orion and Ursa Subdivisions. 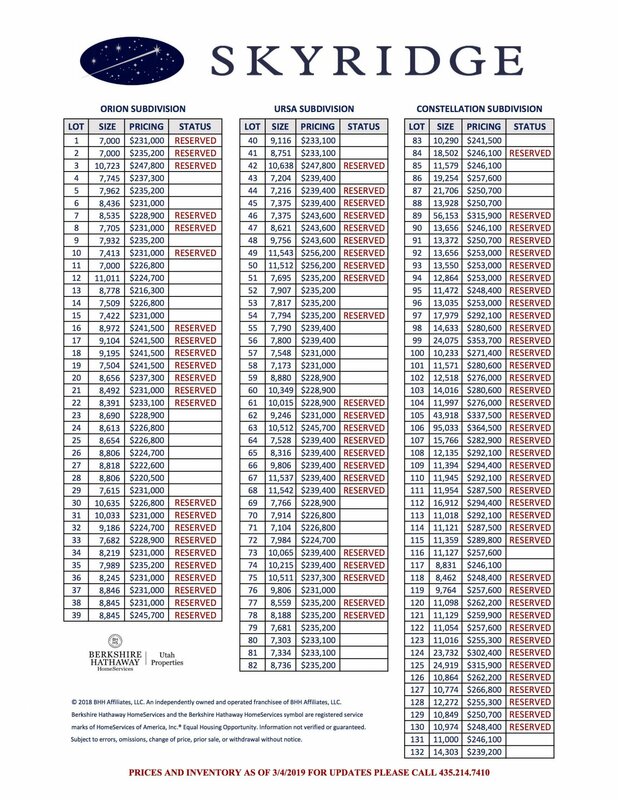 The Constellation Subdivision Final Plat, which contains 50 single family homesites, is slated for approval at the JSPA Planning Commission in March of 2019. 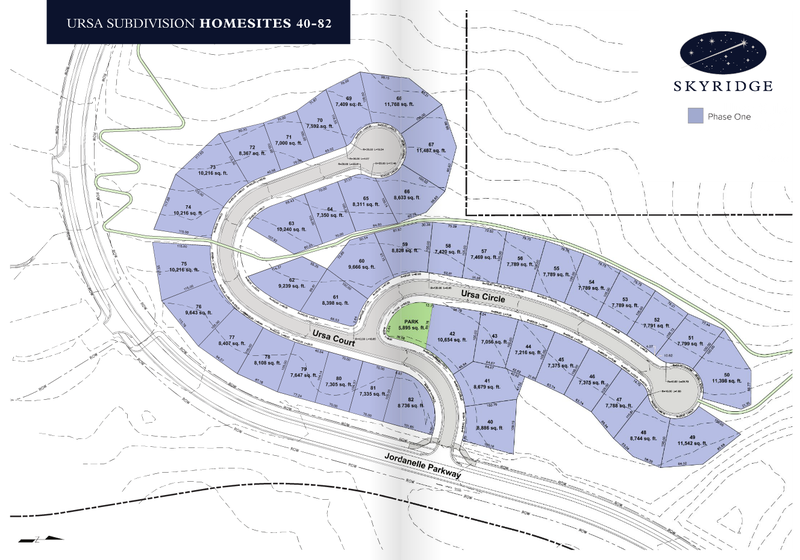 Phase 1 of the SkyRidge Mountain Community is comprised of 132 single family homesites within these subdivisions. Construction of the Jordanelle Parkway has generally continued through the winter despite the intense snowfall, and the road is scheduled to be completed in September 2019. The Orion Subdivision consists of 39 homesites with prices ranging from $220,000 to $237,000. This Subdivision is characterized by its close proximity to the Jordanelle, with expansive water and mountain views. It has relatively flat terrain for easy builds and has an open space corridor through the middle of the subdivision with a paved trail. Orion is also the closest subdivision to the Trailhead/Community Park, SkyRidge Equestrian Center, and Jordanelle State Park Perimeter Trail, allowing for quick access to several different recreational activities. The Ursa Subdivision consists of 43 homesites with prices ranging from $224,000 to $239,000. This Subdivision is uniquely tucked into the gentle rolling hills and dotted with Gambel Oak trees. It has an open space corridor between the two cul-de-sac roads, a pocket park in the middle of the subdivision, and a paved trail that connects to the SkyRidge master trail system. Ursa also features a gain in elevation that allows for sweeping views of both Deer Valley Resort and the Jordanelle. • Clubhouse featuring a grocery café with bar, fitness facility, game room, and outfitter. Privately owned facility available to SkyRidge owners and the public but not part of the HOA. • Infinity pool with cabanas, splash pad, and kids’ area.  HOA owned and operated, open to SkyRidge owners. • Golf Academy and Training Center comprised of a pro shop, practice facility, driving range, putting greens and three golf holes – par 5, par 4, and par 3 – that are designed with multiple tee boxes and greens. Privately owned facility available to SkyRidge owners and the public but not part of the HOA. • Equestrian Center featuring an 18-stall barn, training facilities, indoor and outdoor arenas, pasture, washing and grooming areas, and dedicated equestrian trails. Privately owned facility available to SkyRidge owners and the public but not part of the HOA. • Community Park with playground, picnic tables, and pavilion. HOA owned and operated, open to SkyRidge owners and the public. 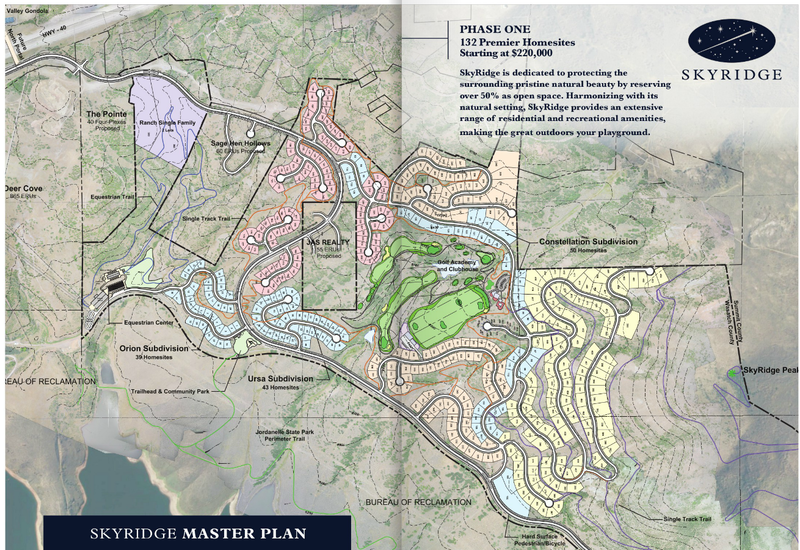 • SkyRidge has worked diligently with Mountain Trails Foundation to connect the SkyRidge community trails to the Park City trail network and is adding miles of pedestrian, hiking, biking, and equestrian trails. SkyRidge trails are HOA owned and operated, open to SkyRidge owners and the public.